The variety of bright and modern colours in the Sunrise collection will create a beautifully modern effect in any room. Contrast the vivid hues with a monochrome interior to really make an eye-catching statement. Or add some colour matching contemporary cushions or art work to your room to create a luxurious environment. The rugs in our cheap rug range are made with high-density heat set polypropylene, machine woven to create a long-lasting, durable rug with a tight, dense pile. So if you are looking for value and quality, look no further. 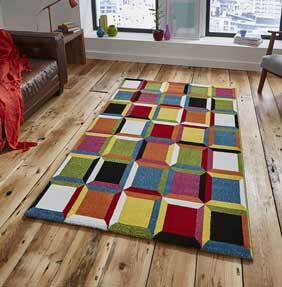 Sunrise rugs are made from 100% high density heatset polypropylene which is machine woven to give a luxurious dense pile. This range is colourfast, anti-static, stain resistant and anti-shedding.